When we call ourselves New Englanders, we lay claim to traditions that stretch back across the generations and all along the landscapes we love. Constant among these is the unbroken thread of song that binds the elements of our cultures together over the ages. Stretching from Indian chants to lullabies, sea shanties, broadsides, folk hymns, fiddle dance tunes, ballads, blues, and ragtime all the way to the modern folk revivals, this is a living heritage that was old when the first Europeans arrived in America. Across the long years, this legacy is still touching the hearts of young people in the 21st century at festivals, on dance floors, and wherever family and friends gather in song. Folk New England is our way of keeping faith with these traditions. While we trace our beginnings to the campuses and coffeehouses of Boston and Cambridge in the 1960’s, our task is to collect and preserve the wealth of musical generations that stretch back into the ages, save and archive them through the use of modern technology, and make them available for study and inspiration now and in the future. We stand ready to work with music lovers, owners of old recordings, scholars, historical societies, institutes of learning, and all lovers of the region to see to it that this rich musical legacy is enjoyed, appreciated, and carried on. Over the past decade, Folk New England has been collecting and protecting hundreds of artifacts stretching back in time: tapes from coffee house performances and house parties, songs and photographs from folk. festivals, dances, and concerts, posters, rare vinyl records, and the treasured spoken remembrances in print, audio tape, and videos. Progress has granted us potent new tools in technology and preservation, but time is of the essence as much of this material is subject to the vagaries of events, the deterioration of tape and paper, and the loss of memory about the times of revolution and revival when we believed that music could be at the heart of the process of building a better world. 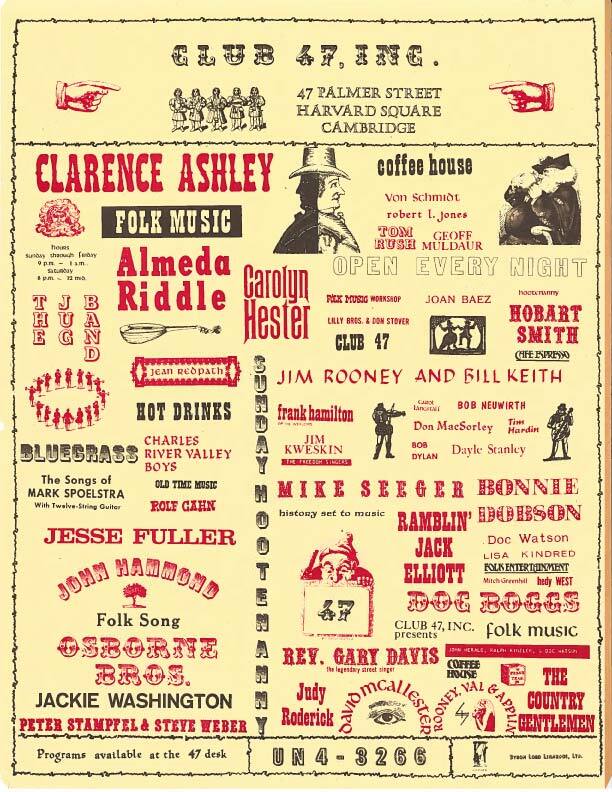 We are calling on all those who love these songs, this place, and all the traditions that call New England home to join us in creating a resource and treasure trove that will keep the lamp of folk tradition burning into the future. Within the past year, our friends have contributed personal collections, supported the scanning of thousands of pages of key documents, including issues of the Boston Broadside from 1962-67, and donated funds for the digitization of rare records, and (most crucially) reels of recorded tapes. We hope you will join us, our volunteers, and our generous donors, in seeing to it that this good work moves forward. If you love a good folk song; if, in your time, you have delighted from the magic in the music; if, like us, you think that folk music is among the best of all the legacies we can leave our children in a confusing and an often uncaring world…then we hope you will consider a generous membership contribution to Folk New England now, and join with us in carrying these beloved traditions on. Folk New England is a registered 501 © (3) organization; all contributions are tax-deductible under applicable regulations. Folk New England is here to help us discover, explore, and preserve the joys of the New England musical frontier. In order to marshall modern technology in the interest of our common heritage, we need your financial support. We hope that you will join us in keeping our musical lamp trimmed and burning, now and for posterity.